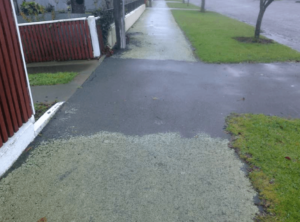 When outside house cleaning, the first question you need to ask when cleaning moss, mould and lichen is to first establish what surface is being cleaned, the integrity of that surface, the desired result and how fast you need that result. 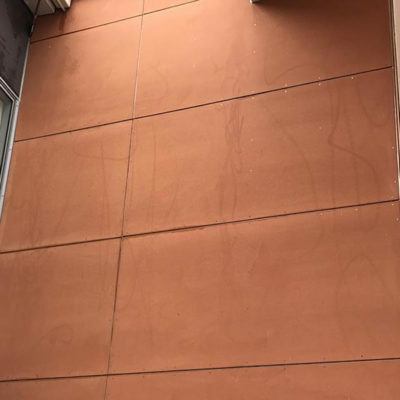 Water blasting is a fast and often a great solution for exterior cleaning moss mould and lichen. 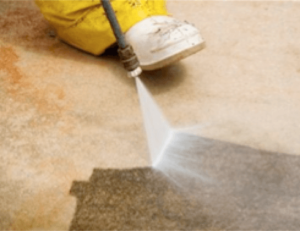 However water blasting comes with it’s own tradeoffs and challenges. Small electric water blasters compensate low water flow for high pressure in the form of a pencil jet nozzle or a turbo nozzle. These nozzles use nothing other than brute force water to clean moss, mould, and lichen. They can and often do leave extensive damage and marks behind which the extent of isn’t fully clear until the surface has dried. 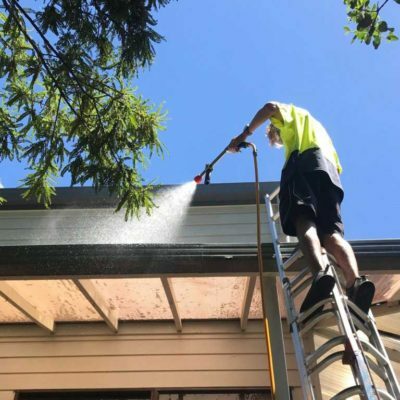 When using a water blaster yourself to clean moss mould and lichen make sure you understand how to operate your equipment and that it’s appropriate for the task at hand. This will save you hours of frustration only to end up with a bigger mess than you started with. 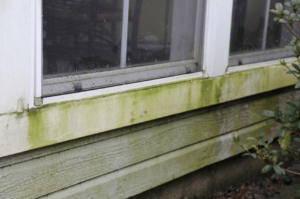 Cleaning moss mould and lichen from a surface without doing damage is a balancing act that takes a lot of experience to perfect and to know what to expect. Having an adjustable pressure solution and enough flow to back off on the pressure will enable you to clean moss, mould and lichen without doing excessive damage. 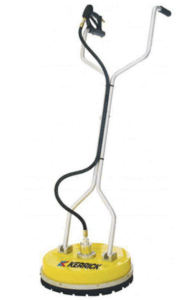 Using a whirlaway can greatly reduce the amount of time you spend cleaning large concrete areas. Each section of concrete cleaned should be washed pushing the whirlaway in a back and fourth motion and overlapping each last cut with the side of the whirlaway. Repeat the process from left to right over the same section to clean off moss mould and lichen effectively. Once the whole area you are washing is complete, the area will generally need to be swept using a lance with a white nozzle. Tip: The whirlaway won’t wash right up to the edge of a wall so areas will need to be washed afterwards with a lance and high pressure nozzle. Warning: Always keep the whirlaway moving from the moment you pull the trigger. Stalled motion with the jets running will cause the jets cut a circle into the surface. These products can be used to quickly clean green mould effectively they may need to be brushed in or scrubbed and then rinsed away after cleaning. For heavier types of moss and mould they will be relatively ineffective. When this chemical is used with a venturi system on a water blaster and the correct nozzles this is the best way to clean black, green and red moulds from the sides of a house. Also known as soft washing or chem washing. Here is a useful house washing article. These type of products are a destructive herbicide extremely harmful to plant and aquatic life. 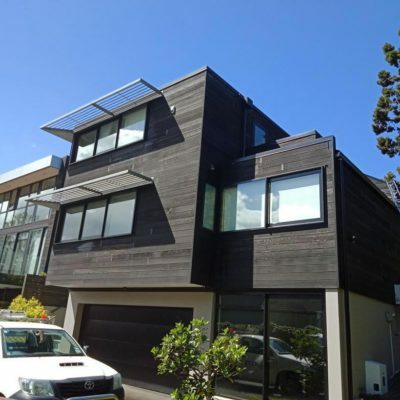 Once a controlled substance in New Zealand it is now available for retail purchase. However this product is no less harmful than when regulated. Although it’s an effective cleaner It should be used with caution when used to clean moss, mould and lichen and a lot of thought given to how the product is then running off into the environment. It will bond to the surfaces of whatever it contacts and break down any organic matter at a molecular level. Great for moss, mould and lichen cleaning around the house but not so much if it hits the water ways, your verge garden or your lungs / skin / eyes. 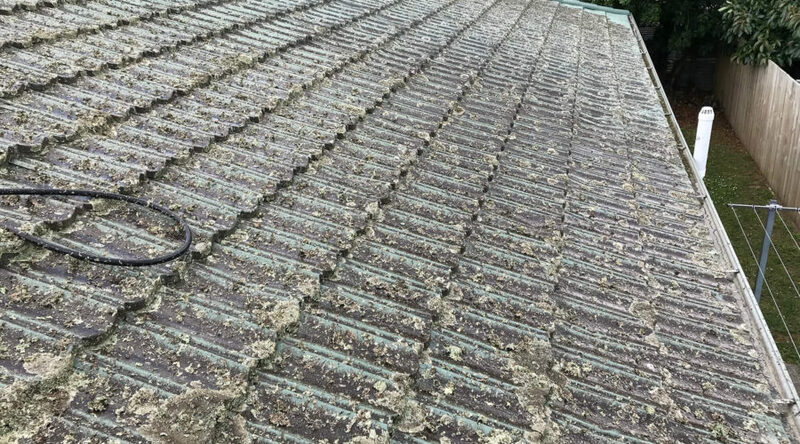 This moss, mould and lichen cleaning solution is a long term solution which will bond to the moss, mould and lichen and clean away with the weather over the course of 6 to 18 months.